Established in 2001, the Orangutan Information Center (OIC) is a trail-blazing nongovernmental organization constituted of a team of dedicated Indonesian conservationists and veterinarians determined to save the critically endangered Sumatran orangutan (Pongo abelii) from a host of threats, including habitat loss caused by rapid agricultural development (especially the proliferation of palm oil plantations), poaching and the illegal wildlife trade. OIC’s Founder and National Geographic’s 2016 Emerging Explorer Panut Hadisiswoyo and I had a conversation about the challenges HOCRU faces, the delicate art of negotiating with business and government, and navigating through the ever-evolving commercial agriculture landscape of Indonesia. Panut Hadisiswoyo with an orangutan illegally kept by local resident. What is the biggest challenge your team faces on the ground on a day-to-day basis with monitoring, rescuing and rehabilitating endangered orangutans? In terms of our team work and preparedness, we aren’t experiencing any logistical or technical problems and everything is great. The only challenge is working with the authorities, which includes working with law enforcement agencies. HOCRU tries to combat illegal trafficking of orangutans and situations in which orangutans are being illegally kept in captivity. We faced significant challenges last year in July. We had to work really hard to rescue an orangutan being kept illegally by a family in a village. We collaborated with the police but they couldn’t do anything to confiscate the orangutan. When we got involved, Kriezna Suhendra, HOCRU’s Field Coordinator, was attacked by the relatives. The family called local villagers to assault our team, and a police officer was kicked in the chest. This happens frequently when we deal with such situations. So we filed a report to prosecute the family and we requested the wildlife authority to put pressure on the family by supporting our report. The police eventually came with a warrant and an order that stated the family would be prosecuted if they resisted the rescue. They finally let us take the orangutan. The crazy thing in these kinds of situations is that they think the animal is a part of the family and love the orangutan very much. The mother of the house was yelling and screaming at us. We heard about another orangutan being kept in the region. But when we came to the house, the orangutan was no longer there. We only saw the chain on the tree, which indicated they had kept the orangutan tied there. They claimed it had escaped, but we were furious, because we knew they’d let it go just before we came. We had reported it to the wildlife authority, and someone told the family we were coming, so they let the orangutan go, which was not good. We now realize we cannot inform anyone including the authorities that we are engaged in a rescue until we’re at the location, so that word does not get out to the families. What happens after a rescue mission? After a rescue, there are two options, we either have to translocate or confiscate the orangutan. For translocations, our veterinarian team does a general check-up to ensure his/her physical condition is good, there are no injuries and so on. We want to reduce and minimise stress for the animal, so we do this as efficiently as possible. We also check for air rifle bullets. Many orangutans we rescue in plantations have rubber bullets lodged in them because local people use this as a way to scare or chase away adults, or to specifically debilitate adults in order to poach the infant or keep it as a pet. Earlier this year we rescued an adult male. On the ground, he couldn’t move in a coordinated way and was very disoriented. We realized he was blind in both eyes as a result of rubber bullets. His eyes had been damaged by it. He had been brutally attacked. This is often the norm. At least 60% of the orangutans we rescue have rubber bullets in them. We let it be if it is in the leg or a particular part of the face. In other instances, if we discover that it is in the gums, or the cheek, we can remove it relatively easily. If it has hit a vital part, we need to send the animal to quarantine, take x-rays and ensure there are no fractures or serious internal damage. One case was devastating for me. 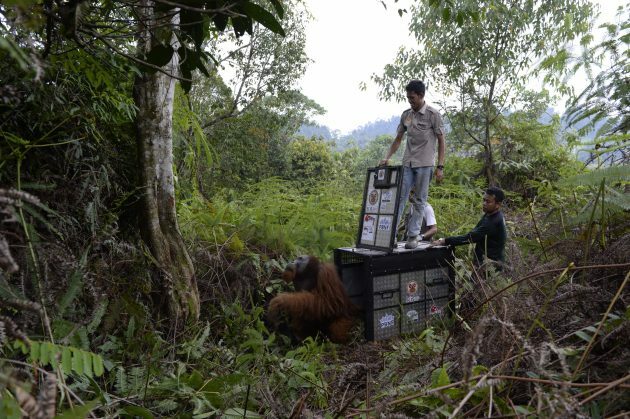 Towards the end of 2015, we rescued a severely injured male orangutan in north Sumatra. We thought he had suffered as a result of fighting with other males. But after the rescue we realized he was very weak and injured and he needed to be sent to quarantine for further examination. X-rays revealed that he had close to 50 rubber bullets in his body. We were not able to save him in the end. I realized that their lives are not peaceful, or safe. 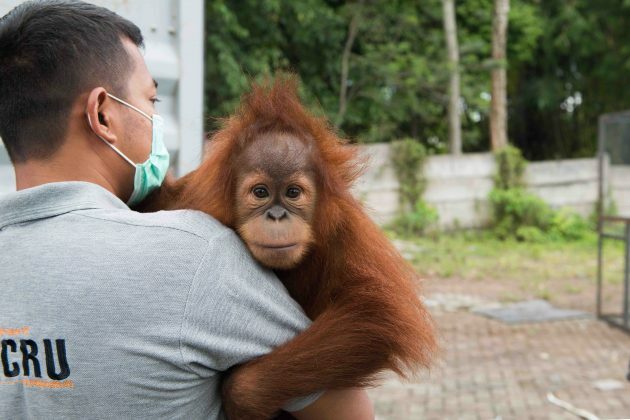 At times like this, it’s very hard to imagine a situation in which humans and orangutans can co-exist peacefully, in human-developed landscapes, in particular. So if we find orangutans that are generally well, we aim to release them into a safe area as soon as possible, so that they get a second chance to start a new life. They adapt very quickly as long as they are released in sites that are within their home range. If there are no fruits in the trees, they will rely on young shoots, young leaves, bark and so on. They know how to survive. We need to be more careful with translocating males because we need to know the population density of males in the new site before we can release a rescued male. Ideally, the density is around 0.1 orangutan/km2. We don’t want to have more than 5 orangutans within a 6km2 area. That’s the challenge with translocation. The other factor is just how physical this work is. Adult males can weigh 80-90kg, and we transport them in crates and transport cages. All of that weighs a lot and if we have to cross densely forested areas and marshy rivers, it becomes even more difficult. Confiscation is a longer and more complicated process, involving orangutans that have been kept by humans. They are sent to quarantine to check for zoonosis because if they’ve been kept illegally in homes, they have been in direct contact with humans. They could potentially have tuberculosis, Hepatitis or malaria. All respiratory diseases can be transmitted, even HIV is a risk. With lab based genetics research, we also need to make sure we know where the orangutan is from because we wouldn’t want to release a Bornean orangutan into a Sumatran forest and with confiscations, you can’t always tell where the animal is from. There is an additional issue with confiscated animals. Many in this situation don’t even know what to do when they encounter other orangutans. They have no memory or sense of being around other orangutans because they were likely taken as infants and have no experience in the wild with their own mother or their own species. So there is no fixed time in terms of when an orangutan has to be released in these situations. They may be in the rehabilitation centre interacting with other orangutans to learn basic skills. We begin by putting them in isolation, in quarantine, to rule out diseases that could be fatal to other orangutans. Once they have been cleared, they are mixed with others in an enclosed socialization area at the rehabilitation centre. After that, they are sent to the forest school, which is situated in the release site, but is also an enclosed area. They are then released. These quarantine and rehabilitation centres have all been established by NGOs and are managed by them as well. In this case, we work with the Sumatra Orangutan Conservation Programme (SOCP). The NGOs work in collaboration with government as well, but the government has not established any rehabilitation centres. If you ask us, we don’t want orangutans being sent to quarantine. It doesn’t really solve the problem. The symptom, the crux of the issue is poaching, wildlife trafficking and habitat loss. So we must spend time to prevent that and not expend all our energy on quarantine protocols and on the rehabilitation of rescued animals. Ideally, if we can address the root of the problem, we would have no need for rehabilitation and quarantine centres. The Leuser Ecosystem is a complex area containing an incredible array of endemic and native wildlife. Tell us more about doing conservation fieldwork in this area. The Leuser Ecosystem is about 2.6 million hectares and where you can find Sumatran orangutans, as well as elephants, rhinos, tigers and sun bears. The National Park is inside the ecosystem and is about 800,000 hectares. 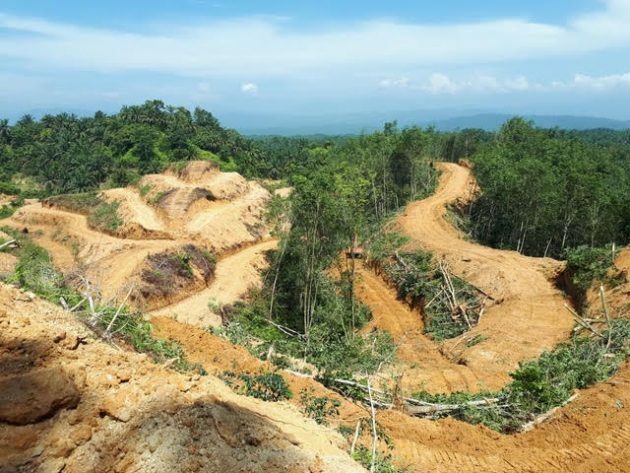 There are some areas inside the ecosystem that are protected forests managed by the local government and some concession areas that are not supposed to be there, but exist because the government already gave permits to companies to develop these areas for plantations. This is mainly outside the national park, but it is inside the ecosystem. The Leuser ecosystem is legally protected. Under Act No.26/2007 on Spatial Planning, it has been designated as an area of high biodiversity, making it a National Strategic Area. So that means any proposal for development should be limited and restricted and there has to be a special case to develop the area. But even the Aceh government only values the Gunung Leuser National Park, not the overall ecosystem. In the special plan that has been endorsed by the government, they don’t mention the Leuser Ecosystem because they have development interests for the future, as they want to convert it for agriculture, building roads etc. About 60-80% of the National Park is mountainous, so there is less biodiversity there and less viable habitats for various threatened species. Outside the National Park the areas are lowland and peatland forests. So that means it supports rich biodiversity. About 70% of the orangutan population lives in the ecosystem, of which only 30% lives in the National Park. Many elephant habitats are outside the park. Many are living within the Leuser ecosystem and near plantations and the protected forests. So this designation (of the National Park) is deliberate because if development was restricted across the entire ecosystem, it would not have been accepted. The Leuser Ecosystem is at a crossroads because it plays a critical ecological role and is being used for agricultural development as well. The pressure to develop is very high here because four million people rely on the ecosystem for livelihoods. So settlements, development, plantations all exist and compete for resources. 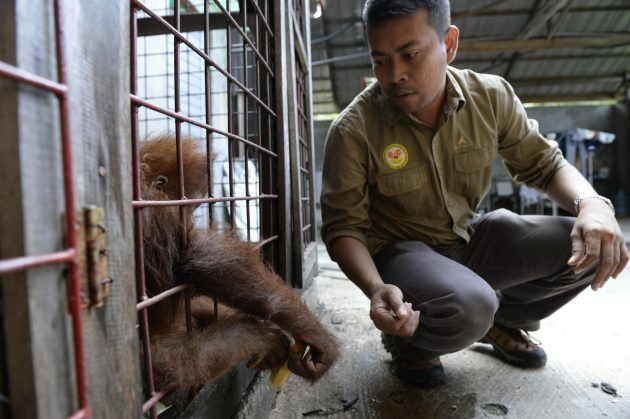 Statistically, where do the bulk of your orangutan rescues take place? The bulk of our rescues take place in agricultural plantations, where orangutans are often stranded or trapped. We’ve generally noticed that the problem is more severe in Aceh province than in North Sumatra. There appears to be more poaching cases in Aceh and orangutans that are smuggled and brought to Medan (capital of North Sumatra province), are from Aceh province. Orangutan trafficking originates from Aceh as well. Mainly because there is a lot of forest loss in Aceh. In Tripa, Aceh, there used to be roughly 3,000 orangutans and now only 200 are left. So you can imagine. The highest number of confiscations originate in Tamiang regency in Aceh. This is the eastern Leuser ecosystem block, so this area is rich in endangered wildlife, including elephants and tigers. But there has been so much deforestation as a result of agricultural development. These animals end up in tiny forest patches and are easily poached by wildlife traders, or killed. So the bottom line is, poaching and trafficking are also by-products of forest loss. It is much harder to enter intact forests and poach orangutans that move easily through forest canopies. Business and government play a vital role in ensuring that conservation succeeds in practice. What are your thoughts on companies engaging in reforestation programmes or implementing “zero deforestation” policies? The trouble is that companies have different definitions of what conservation means. If they say they are setting aside 100,000 hectares to restore degraded peat swamp land, it’s probably land they have already abandoned, so now they have set it aside for restoration. There is no single area that is large enough to provide a proper carrying capacity to have a viable population of a given species. We need to raise questions with companies all the time on this issue. Where is this land exactly? How badly fragmented in this habitat? If the area is fragmented and that block does not connect to a neighbouring forest block, then it may not be beneficial. These actions are well-intentioned and it shows they want to promote good practice by putting aside resources for conservation. But we need to make sure it’s the proper way of restoring a site, otherwise the practice has no value. Indonesia has strict laws to deter illegal plantation development. Yet last year, subsidiaries of influential palm oil companies were found to have supplied fresh fruit bunches (crude palm oil or CPO) that were grown illegally in designated conservation areas rich with endangered wildlife. In their defence, companies will state that full traceability in the supply chain is a huge challenge. What are your thoughts on this? Traceability is still a big challenge in Indonesia, especially to really get to the source of CPO throughout the whole supply chain in the country. It must be the responsibility of the buyer that traceability is transparent. We have come across many cases of companies claiming they have sustainable palm oil, and that this applies across the supply chain, but in reality, there are loopholes and that is not the case. The buyers do their best, but suppliers who claim to be clean are often not clean. As an NGO committed to protecting wildlife, we hope big companies will ensure sustainability in the supply chain, but they have to tackle this. Proper rule of law also matters. In 2014, PT Kallista Alam was fined US$30 million for developing oil palm in deep peatlands and destroying orangutan habitats and starting illegal fires there. It was showcased in Indonesia as an important case. The court has prosecuted the estate manager who is now in jail. But the company has still not paid the fine. So there is a growing movement to pressure the court and the government to make sure that this is done. Smallholders account for about 40 percent of Indonesia’s palm oil output. What do you think is the best way to engage them in sustainable agricultural practices? In many ways, smallholders understand the safety issues when they are cultivating their own land. It’s true that they are involved in burning practices, but the best approach is putting restrictions on the ground by telling the smallholders to follow the regulations. But smallholders sell their fruits to mills run by big companies. When a big company is managing a plantation, they can have up to 100 families on their land functioning as smallholders. These families are given land to cultivate, and then they sell the fruits to the company that is providing them the land. So the other way to look at it is that if the company engages them, they are in the position to ensure that sustainable and responsible cultivation is implemented by the smallholders. Sometimes big companies do not give land to the smallholders. Smallholders cultivate areas surrounding the land owned by the big companies. So once again, these companies can tell the smallholders cultivating land in nearby areas that they will buy the fruit from the harvest if cultivation is done in a sustainable and responsible manner. I feel the government should implement every criteria for both big companies and smallholders. If big companies are having a hard time, then the smallholders should feel the same impact. It should apply to everyone. 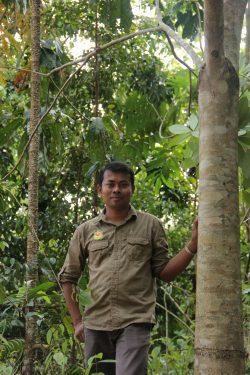 How have attitudes to protecting forests and endemic wildlife changed in Sumatra where you work? The local communities have their own definitions of conservation. But the principles have been fading because of development, population growth and the need for agricultural land and to feed that population. So landscape protection is not a priority. The younger generation are different, in that they cannot create a balance. The older generation treated forests as farmland. They saw it as a source of livelihood and income. But they did maintain the integrity of the forests. They were able to harvest from the forest without destroying it. Non-timber forest products is an example. There are so many resources that they considered as important to their livelihood but it did not constitute encroachment. Then that changed, because the current generation thinks, “that’s my farmland and I have to clear it.” It’s not like the older generation who thought about living in harmony with the forests, of mixed land that is used for food and income and yet, the forest is protected. Now we have this westernized concept of monocultures and plantations. That has dramatically changed the landscape. It has had a strong negative impact on wildlife and protected forest reserves. But you keep forging ahead! Tell us how many orangutans HOCRU has rescued to date, and what lies ahead? We will keep fighting but we hope that someday, we don’t have to do any more rescues because we’ve succeeded in providing orangutans the habitats they need to survive and thrive. We are currently rescuing around 2 orangutans a month. This is the average. Those that we’ve rescued are the lucky ones. We believe there are at least double that number which we’ve been not able to rescue. So for every two we rescue, there are two that are lost— taken illegally, or killed by villagers. We have rescued 150 orangutans over 5 years, 48% of which were males. Of the 38 orangutan babies rescued, 26 were male. But there are probably far more we cannot help. That’s still difficult to accept. 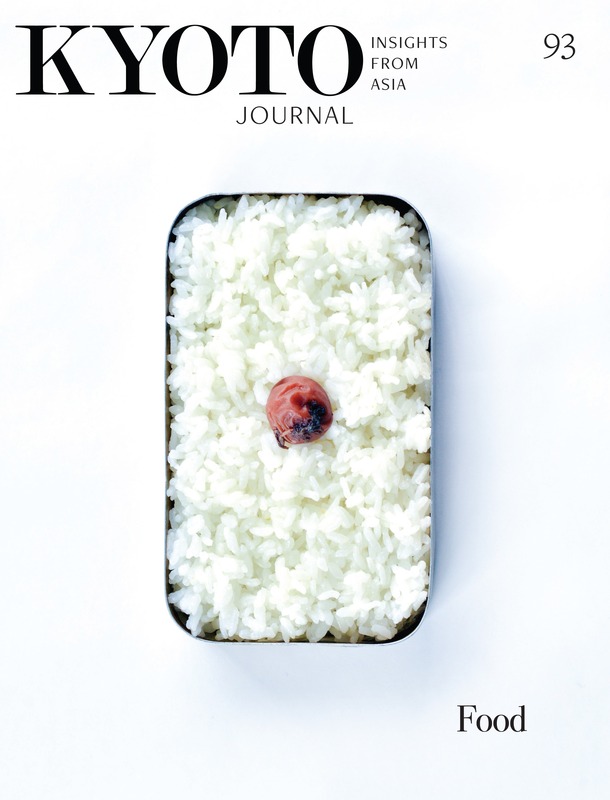 Vinita Ramani is a writer and currently works at Wildlife Reserves Singapore, where she focuses on the uses of storytelling for biodiversity conservation and preventing wildlife extinction in Southeast Asia. A former music and film journalist, she previously headed her own NGO representing victims of mass crimes in Cambodia. This interview was conducted by the author in her personal capacity and not for, or on behalf of, Wildlife Reserves Singapore.